I’ve been handling some requests the last few weeks featuring a fine Scotch, a recommended Canadian Rye and a great Bourbon. So I’m going to jump back into an American Rye with Bulleit Rye! So I’ve been hearing good things about Bulleit and it was in budget so I took a shot on it. Now this distillery is just outside Louisville and even part of the Kentucky Bourbon Trail so what are they doing making a 95% Rye? Well that’s easy, they wanted to take a shot at making a good Rye. So they did what the majority of Rye makers do and they called up Lawrenceburg Distillers Indiana and also Midwest Grain Products to get their hands on some of that ready to blend Rye whiskey. The price is nice, but as you’ll see in the next portion of the review, I feel it’s a touch overpriced for what it is. 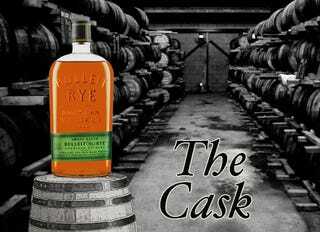 So this Rye is better than the High West Double Rye which was more than $10 more expensive than this, but it’s also not as good as the Crown Royal Northern Harvest Rye I reviewed a few weeks ago. What’s that mean? Well, out of the three I’ve reviewed recently this makes me like the Crown Royal more than I thought I did. This bottle tends to be...harsh. It’s got a lingering after taste and a bit more burn than I expect up at this price range. If I had some vermouth on hand I would have done a challenge to see if it made a better Manhattan on the Rocks than the High West Double Rye. I hate to say it but this barely made the cut for a 3 for me. JUST BARELY. The next time I have some Bulleit I’ll be sure to stick to their strong suit, which is clearly Bourbon. So next month I’m going to be reviewing at least 3 Michigan Made Whiskeys. Partly on request and partly because I’ve really been wanting to try out the Whiskey that is made in the state I call home. I’ll probably take the week of St. Patrick’s Day off as this Irish-American will be drinking some Irish Whiskey that week, and it’ll probably be something I’ve already reviewed.